Last September, Alexander Williams and numerous other students spent the morning at McCaskey High School to audition for LLMEA County Chorus. Little did he know that this would be the first step in a journey that could potentially lead him to another trip to Disney World. Al Williams singing at Disney earlier this month. You might remember Al from the fall play, Arsenic & Old Lace, where Al played the role of the dead body or from High School Musical where Al stole the show with his portrayal of an earthworm. Many in the high school refer to Al as the "voice of L-S" because of his hilarious deadpan delivery of the afternoon announcements. But you may be surprised to know that Al is also a very talented singer. This past weekend, Al and LSHS choir director Mr. Erik Welchans spent the weekend in Erie, PA for the PMEA All-State Chorus Festival. Upon arrival, Al participated in re-auditions, a process in which the students sing the pieces they have prepared for a panel of judges to determine their seating for the festival. After his re-audition, Al placed seventh of the Tenor II section in the state of Pennsylvania. Of all the festivals in which Al has participated this year, his favorite was the PMEA Region 5 Festival (the step before All-States). “It has the most dedicated musicians,” explained Al. The students in Regional Chorus work harder than most because they are fighting for a place in All-State Chorus. 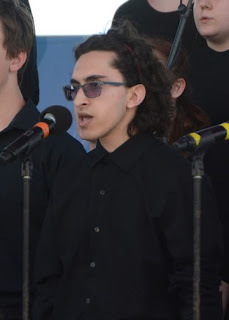 Once students get to All-State Chorus, there is no “next step” that can be achieved at re-auditions, so they often do not prepare as rigorously as they would for the other festivals. Al, on the other hand, put in a lot of effort to place well at All-State chorus. Al playing the role of "the dead body" in Arsenic & Old Lace. So what is the next step in Al’s singing adventures? He will be submitting his audition video for National Chorus soon. And if he makes Nationals, Al will be making his second trip to Disney World of the year for the National Festival. Congratulations and good luck, Al!